Several years ago, our book group read American Nations by Colin Woodard. 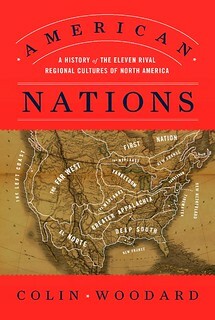 The book has a fascinating premise: While the United States is nominally a single unified country, it’s actually a conglomerate of eleven smaller “nations”, each with its own unique history, culture, and attitudes. The U.S. is more like the E.U. than we think. Yankeedom — Founded by Puritans, residents in Northeastern states and the industrial Midwest tend to be more comfortable with government regulation. They value education and the common good more than other regions. New Netherland — The Netherlands was the most sophisticated society in the Western world when New York was founded, Woodard writes, so it’s no wonder that the region has been a hub of global commerce. It’s also the region most accepting of historically persecuted populations. The Midlands — Stretching from Quaker territory west through Iowa and into more populated areas of the Midwest, the Midlands are “pluralistic and organized around the middle class.” Government intrusion is unwelcome, and ethnic and ideological purity isn’t a priority. Tidewater — The coastal regions in the English colonies of Virginia, North Carolina, Maryland and Delaware tend to respect authority and value tradition. Once the most powerful American nation, it began to decline during Westward expansion. Deep South — Dixie still traces its roots to the caste system established by masters who tried to duplicate West Indies-style slave society, Woodard writes. The Old South values states’ rights and local control and fights the expansion of federal powers. El Norte — Southwest Texas and the border region is the oldest, and most linguistically different, nation in the Americas. Hard work and self-sufficiency are prized values. The Left Coast — A hybrid, Woodard says, of Appalachian independence and Yankee utopianism loosely defined by the Pacific Ocean on one side and coastal mountain ranges like the Cascades and the Sierra Nevadas on the other. The independence and innovation required of early explorers continues to manifest in places like Silicon Valley and the tech companies around Seattle. The Far West — The Great Plains and the Mountain West were built by industry, made necessary by harsh, sometimes inhospitable climates. Far Westerners are intensely libertarian and deeply distrustful of big institutions, whether they are railroads and monopolies or the federal government. New France — Former French colonies in and around New Orleans and Quebec tend toward consensus and egalitarian, “among the most liberal on the continent, with unusually tolerant attitudes toward gays and people of all races and a ready acceptance of government involvement in the economy,” Woodard writes. First Nation — The few First Nation peoples left — Native Americans who never gave up their land to white settlers — are mainly in the harshly Arctic north of Canada and Alaska. They have sovereignty over their lands, but their population is only around 300,000. In the book, of course, the author goes into greater detail about the differences between each region. 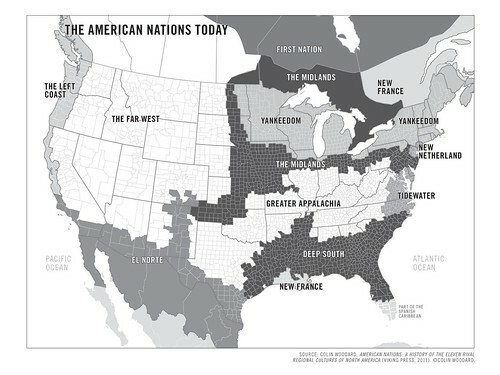 When I first read American Nations, I was skeptical of Woodard’s divisions. Even early in this RV trip, I didn’t agree with how he divided things. Now, as we near the end of our journey, I’m beginning to think he’s more right than wrong. Note: Kim and I have now experienced all eleven of these American nations. Of them, we vastly prefer New France (in the form of southern Louisiana), New Netherland (in the form of New York City), and the Left Coast (where we were both born and raised). We “get” The Far West and El Norte. But much of the rest of the U.S. — meaning most of the eastern half — seems foreign to us, especially the Deep South. There’s a common misconception that the United States was once united. Everyone I know complains about how our national government is so contentious and unwilling to work together. Donald Trump promises to “make America great again”. We have a sort of shared national dream that we were once a unified whole. I’m not sure that has ever been the case. From my reading, it seems like the United States has almost never been united. Our history is one of division rather than unification. We’re always fighting with each other. One place you commonly see the myth of American oneness is in reference to the Founding Fathers. People from both sides of the political fence like to claim things like, “The Founding Fathers believed X.” But you know what? The Founding Fathers didn’t agree on anything except that they wanted to break away from British rule. A decade ago, I read a great book from Joseph J. Ellis. 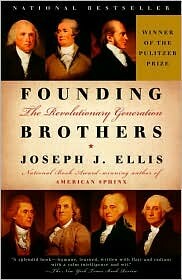 In Founding Brothers (which won the Pulitzer Prize), Ellis tells the stories of George Washington; John and Abigail Adams; Thomas Jefferson; Alexander Hamilton; James Madison; Benjamin Franklin; and Aaron Burr. I came away from the book with a better understanding of just why U.S. politics are so contentious. The division and arguments are actually baked into our Constitution. They’ve been here since the birth of the nation. Here’s an extended passage from the beginning of Founding Brothers. This is long but it’s important. Reading it will help you better understand the U.S. political system. It is truly humbling, perhaps even dispiriting, to realize that the [modern] historical debate over the revolutionary era and the early republic merely recapitulates the ideological debate conducted at the time, that historians have essentially been fighting the same battles, over and over again, that the members of the revolutionary generation fought originally among themselves. Though many historians have taken a compromise or split-the-difference position over the ensuing years, the basic choice has remained constant, as historians have declared themselves Jeffersonians or Hamiltonians, committed individualists or dedicated nationalists, liberals or conservatives, then written accounts that favor one camp over the other, or that stigmatize one side by viewing it through the eyes of the other, much as the contestants did back then. While we might be able to forestall intellectual embarrassment by claiming that the underlying values at stake are timeless, and the salient questions classical in character, the awkward truth is that we have been chasing our own tails in an apparently endless cycle of partisan pleading. Perhaps because we are still living their legacy, we have yet to reach a genuinely historical perspective on the revolutionary generation. But, again, in a way that Paine would tell us was commonsensical and Jefferson would tell us was self-evident, both sides in the debate have legitimate claims on historical truth and both sides speak for the deepest impulses of the American Revolution. With the American Revolution, as with all revolutions, different factions came together in common cause to overthrow the reigning regime, then discovered in the aftermath of their triumph that they had fundamentally different and politically incompatible notions of what they intended. In the dizzying sequence of events that comprises the political history of the 1790s, the full range of their disagreement was exposed and their different agenda for the United States collided head-on. Taking sides in this debate is like choosing between the words and the music of the American Revolution. What distinguishes the American Revolution from most, if not all, subsequent revolutions worth of the name is that in the battle for supremacy, for the “true meaning” of the Revolution, neither side completely triumphed. Here I do not just mean that the American Revolution did not “devour its own children” and lead to blood-soaked scenes a the guillotine or the firing-squad wall, though that is true enough. Instead, I mean that the revolutionary generation found a way to contain the explosive energies of the debate in the form of an ongoing argument or dialogue that was eventually institutionalized and rendered safe by the creation of political parties. And the subsequent political history of the United States then became an oscillation between new versions of the old tension, which broke out in violence only on the occasion of the Civil War. In its most familiar form, dominant in the nineteenth century, the tension assumes a constitutional appearance as a conflict between state and federal sovereignty. The source of the disagreement goes much deeper, however, involving conflicting attitudes toward government itself, competing versions of citizenship, differing postures toward the twin goals of freedom and equality. But the key point is that the debate was not resolved so much as built into the fabric of our national identity. If that means the United States is founded on a contradiction, then so be it. With that one bloody exception, we have been living with it successfully for over two hundred years. Lincoln once said that America was founded on a proposition that was written by Jefferson in 1776. We are really founded on an argument about what that proposition means. When shown in this light, it all makes sense to me. The friction between Republicans and Democrats, and the structure of our two party system, is not something to chafe against; it’s inherent in our political system, it’s an integral part of our Constitution. It’s as if there wasn’t one country founded as the United States, but two, and they’ve been living together, hopelessly tangles, for two hundred years. It’s like yin and yang. It’s like a schizophrenic child. We cannot have one without the other. Democrats need Republicans, both for balance and to provide a source against which they can contrast their own ideas. Conversely, Republicans need Democrats for the same reasons. Taken together, American Nations and Founding Brothers combine to paint a portrait of a country divided…and united at the same time. My RV trip around the country has made this intellectual idea more real to me. When you spend a year (or fourteen months, in my case) traveling from state to state and city to city, you begin to pick up on subtle differences — everything from food, to race relations, to appreciation for nature, to friendliness, to respect for the rule of law. A couple of weeks ago in Gulf Shores, Alabama, Kim and I had drinks with a couple that had driven down from Jackson, Mississippi. They too had traveled the U.S. extensively. We discussed the differences between the states. The man in the couple then gave us an important insight into the Southern mindset. “We don’t like being told what to do,” he said. From his perspective, the rest of the U.S. is always trying to make the South over in its image. This goes all the way back to the Civil War (or the “War Between the States”, as they still call it down here), if not further. It continues to this day. Southerners just want to be left alone, but they feel like other parts of the country are constantly trying to change their way of life. Kim and I keep going back to this conversation. Whenever we see something we don’t like about the South, something we’d like to change, we remember what our acquaintance said. And we haven’t been able to think of a single way in which the South has imposed its will on us out in Oregon. Over the past fifty years, there’s been a huge unconscious push toward “same-ification”. (This is due largely to the omnipresence of television, I think.) But I’m not sure homogenization is such a good thing. I like the parts of the U.S. that feel different and unique. I like when we work together despite our differences. In fact, I think it’s all of our differences that make this nation great. But how do you find a balance between respecting cultural differences and respecting each and every person? I don’t know. I’m not sure anybody does. Still, it’s a worthwhile conversation for the American nations to have. Thanks for the interesting article. As a history major I really enjoyed it. Your preferences seem class-based to me, rather than regional. While I have no doubt that this author’s artificial divisions exist regionally, this is probably because of socioeconomic statuses and pressures within those regions. I’m going to share this article with my husband. He’s a political junkie and I think he’ll enjoy it. Still hope we get to see you in Texas this summer! Interesting read. Would have expected more comments! In any event, you certainly learn that there is great variation in the US which becomes obvious if you travel a bit. We are not a one-size-fits-all country. There are a wide variety of solutions (or not) to problems. All the answers don’t need – and shouldn’t – come from Washington, DC. I read this book a few months ago and found it to be fascinating and rather mind blowing. It is truly a unique way to look at the Americas and certainly explains much of the political and social realities we see today in the United States. Highly, highly recommended to anyone who is interested in history, politics and sociology. I read the first book and strongly agree with the different regions. I was born and raised until my mid-teens in the same county Gulf Shores is in (Deep South) moved to Colorado (Far West), and also lived in DC (Tidewater) and the DFW (Greater Appalachia). I’m personally most comfortable with the Far West culture and most appalled by the Deep South’s. The cultures are all so strikingly different. However, I’d say the Deep South starts as far west as Dallas, though Fort Worth is slightly different. Generally I felt that Texas was culturally between the Far West and Greater Appalachia. It was comfortable enough for the two years I lived there but never home. While I don’t consider myself conservative, I am to the people in New England and the Left Coast. The Far West has a much more libertarian mindset than other areas I’ve lived and I’m somewhere left of center (for Colorado and way left for the Deep South). The thing is, you can always find people who identify with you culturally in a big enough town (Fort Worth for example, or even Denver). It seems to create a lot of conflict though in these communities which are no longer so homogeneous. Lifelong Left Coaster here and I have always had trouble with understanding the Deep South. I have been overseas a few times though I have not traveled the US much. I cannot wrap my head around why Southerners are so adamant at not changing some truly horrific social mores, why they do not grasp the benefits of pluralism and inclusion of different races, sexualities, etc. It seems fairly obvious that the policies they cling to are NOT benefitting them (high rates of poverty, teen pregnancy, STI, poor school curricula, etc.). Why can’t they change? Fear? Fear of becoming like those freaks up North/out West/all over the world who can accept that people are different and everyone deserves to have their humanity recognized? Apologies if that is too ranty. Orlando was only a few days ago and the media since has been disheartening, to say the least. Previous post: Money Boss — and More!